Insignares’s family valued education above all else. She attended the University of Illinois to study finance, concentrating on speculative markets. Insignares liked knowing exactly how a business handled its money. She interned at the Chicago Mercantile Exchange as a runner in the cattle and hog pits. In her final year as an undergraduate, Insignares met Dr. Phil Garcia, an agricultural professor, who, like Insignares, grew up in an urban environment. He became a valuable mentor and inspired her to get her master’s degree. She was one of just a few female students in her agricultural economics program. Her thesis on managing beef market risk would foretell her future success at Darden Restaurants, the company that owns LongHorn Steakhouse, Olive Garden, and other leading restaurant brands. Insignares moved in 1997 to Orlando, FL where she had responsibility for everything except seafood as the director of commodities purchasing for Darden. Using skills she had already learned through college internships, KFC, and subsequent jobs, she was able to impact a large chain by managing the commodities purchasing for a variety of restaurants instead of just one. The experience inspired her to return to school at the University of Florida where she would earn her MBA. She also got married that year. “People said I was crazy going back to school while I was so busy, but without obtaining that level of education, I wouldn’t have been able to climb to where I am today,” Insignares says. By 2001, Insignares had been promoted to senior vice president of operations, for which she moved to Dallas. From Texas, she led operations in eight southwestern states. Her first daughter was born in Texas in 2003. Continuing to be geographically flexible, Insignares traveled about 80 percent of the time. She was inspired by the diverse, hardworking people staffing the restaurants. “I took it one step at a time and pinched myself along the way,” she says. In 2004, Insignares moved back to Florida to become the executive vice president of operations for Olive Garden. During this time, the chain underwent an aggressive growth phase. 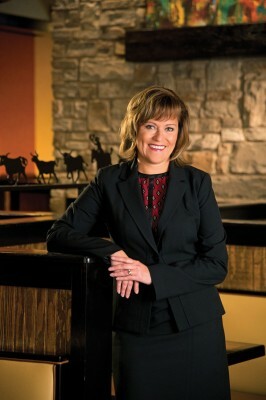 Insignares and her team added more than 250 restaurants in seven years. In 2007, Insignares had her second daughter.